Just over a month ago, we saw that real-estate development company Genesis Land (GDC) hired a 3rd party appraiser to value its land holdings. The signal from management was clear that it believed the market was severely undervaluing its properties. The appraisal results did not disappoint; the company's stock price rose 25% on the day the appraisal results came out. Nevertheless, this situation appears to illustrate that stock values do deviate wildly from net asset values. We saw this last year when we looked at the example of Melcor, not once but twice. For the enterprising investor who takes the time and effort to appraise company properties, there are likely huge gains to be made, as the market is clearly not efficient. Value investors love finding stocks trading at low P/E values, as this means the price that must be paid for the stock is low relative to the company's earnings. But the investor cannot assume that current or recent earnings will persist forever, as this could result in an overpayment for a stock. One warning sign in particular that may indicate that earnings may not persist are abnormally high returns on equity. The same feature of capitalism that has provided continuous improvements in productivity and our standards of living will also erode the earnings of investors who do not pay attention to its power: competition. When firms are able to generate abnormally high returns, a plethora of copy-cats will attempt to replicate its success. Consider Cambrex Corporation (CBM), maker of active ingredients for pharmaceutical products. In 2009, the company generated operating income of $26 million against a market cap of just $128 million. But can it keep those levels of earnings going? That depends on whether the company has any advantages that the competition cannot erode. As a producer of commodity products, the company has at least 25 competitors in Western Europe and the United States, and many more in low-cost regions such as Asia and Eastern Europe. It's important to note that every company will claim to have a competitive advantage. In the case of Cambrex, it has patents covering various processes and claims to have superior manufacturing know-how. However, only someone who understands the industry and the companies within it quite well will be able to determine if these advantages are real, and if they may result in strong returns that are sustainable. This once again highlights the need for investors to restrict themselves to areas within their circle of competence. Barring a competitive advantage, competition will erode the returns of a successful operation. Companies like Coke (KO), Intel (INTC), and Google (GOOG) clearly have competitive advantages that have allowed them to generate abnormally high returns for sustained periods. Of course, there are many more companies with competitive advantages, even small ones. But if the investor is counting on such returns to be persistent, he should be able to identify that advantage, lest he overpay for a company that is soon to see its earnings return to more normal levels. When a US company announces that it will de-register its shares, it no longer has to file annual and quarterly reports with the SEC. While this can reduce expenses significantly for certain small companies, it is invariably followed by a drop in the company's share price, since the appeal of investing in a company that doesn't have to make such reports is quite low. Three months ago, we discussed a company called Boss Holdings (BSHI) that proposed to deregister, but that had avoided a massive drop in its share price. Its proposal included a payout of $7.65 per share for shareholders owning fewer than 100 shares. So while some downward pressure on the stock was undoubtedly placed by shareholders exiting the soon-to-be-deregistered company, upward pressure was created by new buyers looking to make an arbitrage profit by buying fewer than 100 shares. Last week, shareholders voted to approve the measures, which is no surprise considering management controls the company. But even though this proposal is now on the verge of going through, an arbitrage profit still exists! That is, the shares still trade for less than $7.65, allowing shareholders who buy up to 99 shares the opportunity to cash in for more than they pay for their shares. But out of all this comes another opportunity. Because of the $7.65 offer, the shares may well immediately drop soon after the reverse-split/re-split takes place, since there will no longer be upward pressure on the stock. As such, owners of BSHI who plan to stick with the company even as it de-registers may wish to sell at the current price and buy back following the transaction, presumably at a lower price. Investors in a risky mood may also consider shorting the company at its current price, on the expectation that the shares will drop following the $7.65 payout. Of course, liquidity could pose a significant challenge to such an endeavor. Unique situations can sometimes offer investors profit opportunities. I look forward to re-visiting this situation post-transaction to observe the results. Before they can make money, companies must make capital investments. But since the future is always uncertain, investments with longer payback periods are often more risky than those with shorter payback periods. This is because the shorter the payback period, the lower the risk that market conditions can render the initial investments obsolete/useless. One company towards which this idea has a useful application is GameStop (GME), a retailer of new and used video games. As we've previously discussed, the future of the retail video game business model may be very different than it is today. As such, large capital outlays with payback periods many years out would be a risky endeavor for this bricks and mortar business. However, based on the company's disclosures, investors can actually estimate how long it takes for a new store to pay for itself. This year, the company will spend $75 million to open 400 new stores, which equates to opening costs of just under $190K per store. In addition, it appears as though the company spends about $20K per year per location sprucing up its stores. But the company's annual operating cash flow suggests that the average store generates about $100K annually. As such, it appears as though it only takes about two years for the average GameStop location to pay for itself! Of course, these are only rough calculations and are likely far from perfect. For one thing, the calculations assume new stores can generate as much cash as existing stores, whereas the markets for new stores are probably not as attractive as the markets that have already been established, which could increase the payback period going forward. On the other hand, there are likely economies of scale such that revenues from new stores can grow at a faster rate than do corporate-level expenses, which would reduce the payback period. In some industries, investments are made with payback periods many, many years out. (For example, consider how the oil and gas industry operates.) For a company like GameStop, short payback periods reduce the risk that a changing industry can turn GameStop into the next Blockbuster Video. Short payback periods allow GameStop to be nimble and shut down locations that should turn unprofitable, without the large costs that would otherwise be borne by shareholders. As the chief investment officer at Fremont Investment Advisors, Nancy Tengler employed the value approach she describes in her book, New Era Value Investing. Tengler starts the book by discussing how value investors don't get sucked in by the "It's different this time" crowd. When certain industries or companies are out of favour in the market, that is often the best time to buy them. Nevertheless, the market has changed in some ways over time, and value investors can refine their methods to identify more undervalued stocks. Some of the methods employed by traditional value investors can be more difficult to apply as the market evolves. For example, the percentage of companies in high-tech or growth areas has increased over the years, while the relative size of dividends has decreased. For example, technology and health care stocks have doubled to 30% of the S&P 500 since 1990. This has served to reduce the playing field for value investors looking to apply traditional methods of company analysis. Despite these new methods that Tengler will discuss in this book, the principle of having a disciplined approach to buying stocks that trade at discounts to their intrinsic values still remains. As such, she argues her new methods are not suggesting that "it's different this time", but are rather meant to expand the securities in which value investors may show an interest. Charlie Munger says the most important rule in management is "Get the incentives right". Munger argues that the power of incentives is constantly underestimated. In Freakonomics, Steven Levitt shows us how pervasive incentives are in society, and what we can learn from that. Value investors who can grasp the power of incentives put themselves in a position to understand which companies are utilizing the full potential of their managements. Levitt continues to use the economic tool of regression analysis to illustrate some correlations which are not widely known. Levitt notes that in the aggreggate, white and black parents give their children very different names. Therefore, he sets on the task of determining whether the names of children tend to affect their socioeconomic status later in life. Some startling research has shown that job applicants with "black" names are less likely to get call-backs from potential employers (This research was done by sending out large resume samples to employers, some with black names and some with white names.) Furthermore, Levitt finds that an adult with a "black" name does end up with a lower socioeconomic status. But using regression analysis, Levitt explains that after holding other factors constant (e.g. race, income, education etc. ), a person's name actually matters not in his future success or lack thereof. Parents, however, spend great time and resources coming up with a name that will set their child up for success. In doing so, Levitt has found that popular names filter down the status levels, with popular names among high-income earners becoming popular names among the general population some years later. People (illustrated here in the last two chapters using parents as an example) routinely put resources into factors that they cannot control. In doing so, they will often ignore factors that are important. Managers should seek to educate themselves so that they may apply their time towards efforts that yield positive results. A rather large percentage of companies experienced declines in revenue in both 2009 and 2008, as the general level of aggregate spending declined in most markets. For most of these companies, these declines can be considered temporary. However, investors must take care not to assume that all firms with revenue declines are experiencing only temporary issues; for some firms, the drops in revenue are part of a secular (rather than cyclical) decline. The determination of whether a firm's decline in revenues is temporary is part art and part science. We've previously discussed the analysis of the more subjective parts, which involved considering the company's line of business and determining its sustainability. In addition, the investor can take direct clues from the company's financial statements and management's discussion and analysis to help determine the state of the business. Consider Reliv (RELV), producer and marketer of nutritional supplements and skin care products. The company blamed its poor performance in both 2009 and 2008 on the economic crisis, but further study indicates that the company had problems way before then. Revenues have declined for several consecutive years, and though the company remains profitable, assuming the company's average profits over the last several years represents its earnings power going forward could lead to a poor investment result. Examination of management's discussion over the last several years does not help assuage fears that the company is on the decline. In both 2007 and 2006, otherwise good years for the economy and companies selling health products, management blamed lower sales numbers on the fact that fewer distributors were able to move its product, and that certain products saw drops in demand. In effect, "our sales were lower because our sales were lower". Further study of the company's business model also suggests the company's past returns are not sustainable. In 2006, the company generated an ROE of over 30%. Considering most of these products can be copied, and the company's business model can be completely replicated, these kinds of returns invite competition into this category. And that's what appears to have happened, as despite rising health awareness country-wide, the company has experienced several years of decline. Companies experiencing temporary declines in revenues/earnings can be picked up at bargain prices by value investors. Investors must take care, however, not to assume that all declines are of a temporary nature. Some industries (e.g. the newspaper industry) and some companies are in secular decline, and the identification of such companies is not always trivial. "Patent expirations" are the two words most commonly used to dissuade investors from investing in pharmaceutical stocks. With respect to Pfizer specifically, 20% of its revenues are expected to be significantly affected by the loss of patent on flagship cholesterol drug Lipitor. But the market's pessimism combined with some changes at the company may result in extraordinary gains for long-term shareholders at the current price. Of course, such a chart does not give a complete picture of the future, as many drugs will fail their trials, and the potential market size of each drug is not illustrated, but these results are certainly encouraging on their own. 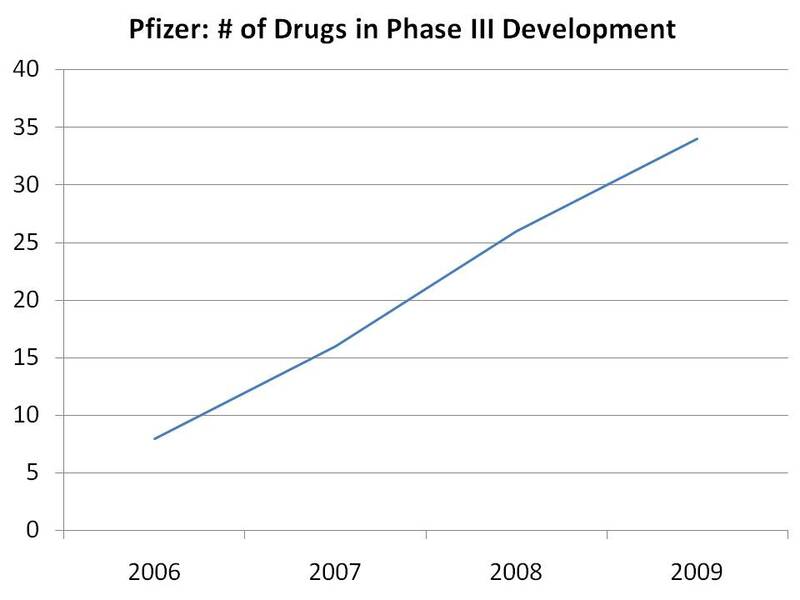 CEO Jeff Kindler, who has been with Pfizer for 9 years, noted in the company's last conference call that "[W]e are more enthusiastic about our late stage pipeline than we have been in years." Of course, such comments from CEOs must be taken with a grain of salt, as managements have incentives to boost confidence in their own company's stock. But an analysis of Kindler's previous statements over the years suggests this comment may be genuine. Pfizer's average return on equity over the last five years of 13% also confirms that management is not reckless with its investments, and is prudent with capital allocation decisions. In previous years, Pfizer has managed to generate these strong returns even while holding a relatively large net cash position. With the acquisition of Wyeth a couple of quarters ago, however, the company is now employing all of its shareholder capital - and then some. The company now has a net debt position of $20 billion, compared to a net cash position of $8 billion at this time last year. As a result of this swing, the company now has almost $30 billion of additional earning assets. The acquisition of Wyeth also adds steadier products such as Advil, Robitussin and ChapStick to Pfizer's portfolio, which mitigates the risk that accompanies larger debt balances. From a valuation point of view, the pessimism surrounding this company has made it look cheap. Management estimates earnings per share of approximately $2.30 in 2012, versus a current stock price of $16. 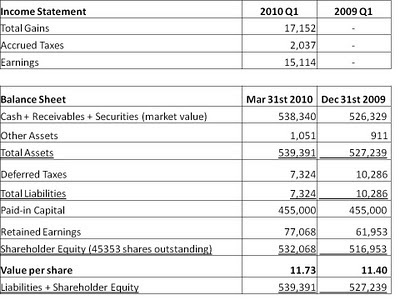 Investors should note, however, that management's numbers are significantly higher than the GAAP numbers, as management likes to report a number that excludes various items; shareholders should ensure they understand these differences, as non-recurring charges in this industry tend to be the norm rather than the exception. When we met with value investor Francis Chou almost two years ago, he was bullish on the pharmaceutical sector as a long-term value investment. Since that time, valuations for many of the large pharma companies (Pfizer included) are down, while changes in companies like Pfizer are likely to have a positive effect on future earnings. As the market continues to be pessimistic on this sector due to upcoming patent expirations, much of the downside risk is already priced in. 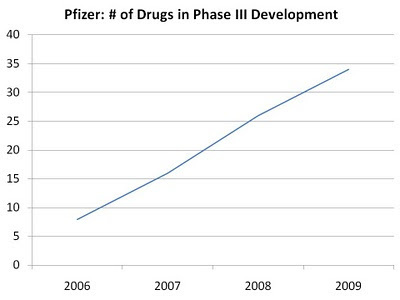 At this price level, companies like Pfizer could offer superior long-term returns. Some regulatory changes make minimal impact on company valuations - at least in the short-term. Other regulatory changes, such as tax rate changes, affect almost all companies equally. But some regulatory changes affect only a small group of companies, and in a big way! In late 2009, a new federal law was enacted that significantly expands the Net Operating Loss carry-back opportunity for businesses. In effect, this allows companies that experienced large losses in 2008 and 2009 to offset them against gains they experienced in the five previous years, allowing them to recuperate tax payments they have previously made. For most companies, this regulatory change may mean nothing at all; for companies that broke even or incurred only small losses in 2008 and 2009, or for companies that incurred large losses in 2008 and 2009 but don't have correspondingly large gains in immediate prior years, this tax treatment change makes little difference. But for some companies, the change can turn a company from a sell into a buy! Consider Chromcraft Revington (CRC), producer and distributor of residential and commercial furniture. The company has had a particularly rough couple of years. In 2008 alone, it lost $25 million on revenue of just $99 million! In previous years, however, it has been rather profitable. As such, the refund the company is to receive based on the regulatory change is $6.5 million. To put this in perspective, the company's market cap is just $15 million! The regulatory change alone turns this company into one that trades at a discount to its net current assets! Paying constant attention to regulatory changes can be an arduous task. Most changes make little to no difference in the vast majority of company valuations. For those paying close attention, however, opportunities can arise when a regulatory change has a significant affect on a company's finances. It is difficult to judge the market's appetite for risk simply on the basis of the equity markets' price levels, as determining what constitutes "too high" or "too low" a price is challenging. One can compare a market's price to its earnings or its book value, but earnings are a moving target and are subject to large non-recurring costs (even in the aggregate) while the efficiency with which assets and leverage are employed also changes. Dividend yields are often used as an indicator of the market's appetite for risk, but increases/decreases in the utility of retained earnings (that is, do companies have opportunities to generate solid returns on earnings they do not pay out?) can render yield-comparison exercises ineffectual. Furthermore, the increasing and volatile use of stock buybacks as an alternative means of returning capital to shareholders adds uncertainty to such comparisons. Nevertheless, there are means by which the market's general appetite for risk can be estimated. One such method uses the TED Spread, which measures the difference between inter-bank lending rates and US government debt, which is currently considered by many to be risk-free. A high spread (or large difference between bank rates and government rates) suggests investors are scared of lending, as perceived risk is high. 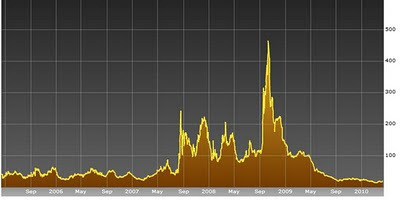 From the chart above, it is easy to see why economists were warning of a liquidity crisis in the fall of 2008, as spreads widened dramatically from their previous levels, and continued to rise until the end of the year. At such times, the cost of borrowing is exceedingly high as owners of cash were in no mood to provide capital. But since May of 2009, spreads have declined dramatically. Not only have they recovered to their pre-crisis levels, they are below the spread levels seen in the last boom-cycle! Considering the economy is still in recovery mode, this eager willingness on the part of capital providers to take on risk is rather surprising. Lenders of capital to banks are currently asking just 15 basis points of return above what government debt returns, despite a rather fragile economy! What does this mean for the stock market? Maybe nothing, maybe a lot! If investors are once again pricing assets such that they perceive little to no risk in them, prices could fall significantly the next time the market is spooked. The current level of the TED Spread suggests providers of capital are doing just that. Companies trading at discounts to their net current assets are often valued by estimating their liquidation values. For many years, this may have made sense, as only companies in extremely terrible shape would ever trade at such levels. Since the market crash of 2008-2009, however, even companies with decent prospects of profitability have traded at such abysmal levels. As a result, it would be imprudent to value net-nets based only on their estimated liquidation values; instead, for the majority of cases, effort should also be exerted in valuing the company as a going-concern. When a stock's estimated liquidation value is compared to its share price, the investor can get a decent idea of the stock's downside risks. But the upside in a stock is not limited to its liquidation value; assuming this to be true could result in an investor selling a stock for far below its intrinsic value. Consider H Paulin (PAP), a manufacturer and distributor of automotive hardware components. The stock has doubled from its lows in 2009, and yet it remains an attractive purchase. To place a sell value on this stock that is equal to its estimated liquidation value would appear to be a little too conservative, even for the strictest of value investors. The company trades for $28 million, but earned $2.4 million in 2009 under very poor industry conditions. Recall that this is a company that operates in two business lines, one of which is doing well while the other is faring poorly. By ceasing to invest in the poorly performing business, while increasing investment to the business that is growing profits and market share, the company is positioning itself for continued success. Indeed, based on a number of operating metrics, the company appears poised to add value for shareholders by continuing to grow its distribution business. As such, placing an upper-bound on this company's price that reflects only its estimated liquidation value could result in underestimating this company's actual worth. Various research (one example here) suggests that buying a portfolio of stocks trading at discounts to their net current assets, and selling them when market values and net current assets converge, will beat the market. To value investors, this is old news. But it is likely possible to even outperform such a portfolio by not forcing stock sales in cases where a company's intrinsic value clearly exceeds its estimated liquidation value. Levitt makes an argument that we do not use data enough to come to the conclusions that we come to. We rely on our pre-determined beliefs and biases to draw conclusions, and rarely seek out objective information. Nowhere is this more apparent than in the management of offspring: parenting. In a house that contains both a gun and a swimming pool, children are roughly 100 times more likely to die in the swimming pool than at the hands of a gun. But our beliefs about the dangers of guns ensures the focus is on the gun rather than the more apparent danger, drowning. Levitt uses economic tools (namely, regression analysis) to figure out the role of various parent initiatives. A regression analysis is a statistical tool that allows the scientist to control several variables from within a mountain of data, thus allowing us to determine which variables have an effect on the output. It's important to note that a regression analysis can only show correlation, not causation. That is, the first eight factors above may not cause higher test scores, as there could be another factor that causes both one of these eight factors and the higher test scores to occur simultaneously, or the causation could be reversed (e.g. higher test scores could cause a higher interest in books, leading to more books in the house). In this chapter, Levitt illustrates a great number of economics-related lessons that can be learned from the national drop in crime that took place in the mid-1990s and the media reaction to it. Certain members of the media will always extrapolate trends into the future without understanding the underlying causes of those trends. Crime was on the rise for several years preceding its peak, and "experts" were proclaiming that the worst was yet to come. When a stock or market rises or falls, the media will make headlines with scary and astonishing predictions of the future. When "experts" are proven wrong, they will often remain overconfident in their abilities to predict, explaining away their faulty predictions with excuses. When crime did not rise as anticipated, many experts claimed it was the alarms they raised that put into motion counter-effects that helped quell crime. When stock market analysts are wrong, they use a range of excuses from ceteris paribus to if-only defenses. When an event has occurred, the media and experts will all try to explain it, but many will do so on hypotheses without basis. To explain the drop in crime, the media cited several specific reasons. Levitt, however, goes on to show that only three could have contributed to the drop in crime, while the others cannot be shown to be effective from the data. Every day, we are offered explanations for why certain markets/stocks/commodities went up/down, when in reality very little evidence is offered up to back these claims. Levitt also provides his own theory of the major reason for the crime drop in the mid-1990s, and backs it up with a great deal of data interpretation. Hanwei Energy (HE) is a Canadian-headquartered company that operates in the industrial pipe business (for oil, gas and water transmission) primarily in Asia. The company trades at about a 30% discount to its net current assets, but has seen its revenue decline as a result of a combination of factors (more competition in one of its major markets, the global recession, transformation of one unit into a joint venture, etc.). Unlike most net-nets, however, the company is mostly breaking even, and therefore may appear to be an attractive investment for value investors. Further investigation, however, reveals some caveats to look out for even for profitable companies trading at discounts to their net current assets. First of all, the company's accounts receivable constitutes a large part of its current assets. While the company believes strongly in its ability to collect on it, the size of the receivables equate to over a year's worth of sales, meaning many customers are likely significantly overdue on their payments. Adding to the risk of the receivables situation is the company's debt. Indeed, two companies with differing debt loads can have the same level of net current assets, but one is still more risky than the other. Consider two companies, each with net current assets of $50 million, but where Company A has $50 million of current assets and no liabilities, while Company B has current assets of $200 million against $150 million of debt. If half of both company's current assets become in doubt, Company A is still in a position to survive; Company B, however, becomes underwater, with shareholders at serious risk of losing their entire principal. "The Company’s 2010 growth plan requires additional working capital of Renminbi (“RMB”) 150 million ($23 million). This mainly includes working capital to support the growth in the pipe business. Management plans to finance these working capital and investment needs with cash on hand, cash from operations and debt facilities which have been arranged with Chinese banks. Management also believes that it has the ability to access additional equity financing if needed..."
So rather than reduce risk by paying down debt where possible, the company is actually planning to continue to lever. If business operations are indeed successful, the reward to shareholders at this price could be handsome. Unfortunately, the risk of principal loss (which value investors seek to avoid) also appears high. Where possible, value investors should try to determine a company's plans going forward, and should be wary of investments with too much or increasing leverage, as the risk of principal loss increases in such situations. What is the investment philosophy of The Polonitza Group? "The Polonitza Group consists of a number of ITEX shareholders who believe certain strategic decisions and acquisitions made by the Company in recent years have strayed from the focus of expanding and supporting the company’s #1 asset, its franchisee network. We have made a number of proposals which we believe will improve the long term value of the ITEX Corporation." How would you characterize your relationship with ITEX’s Board of Directors? Have they been open to input, or do they see you as a threat to their positions? I see they have accepted some of your suggestions, such as authorizing a share repurchase plan...is this because of arm-twisting, or are they genuinely open to incorporating other ideas? "Based upon communications we have received from members of ITEX’s Board of Directors, they do not seem to be interested in entering into a constructive dialogue with our group." Do you have contact with the other major outside shareholder of ITEX, value investor Sardar Biglari? Would you say his investor interests are aligned with yours? "The Polonitza Group has no affiliation with Mr. Biglari or any of his entities but we welcome any suggestions made by ITEX members, franchisees, or other shareholders." Why should the readers be interested in ITEX stock? You've been on a buying spree of ITEX...what do you think shares of ITEX are worth? "I cannot comment on ITEX’s stock price or my personal opinion on its value. In general, all shareholders, as part owners of any corporation, should take an interest in how a company operates and is governed." What are the top 1 or 2 things you would like to see management do that it is not currently doing, or what would you like to see management improve on? Your letter of March 23rd outlines a number of initiatives, but give us THE priority in your opinion. "ITEX’s number one priority needs to be the success of its franchisee network. This includes ensuring franchisees increase their profitability while having the incentive to expand their operations. Acquisitions or initiatives not aimed at improving or expanding the franchisee network need to be carefully examined. Additionally, we believe that ITEX must do a better job at recruiting new franchisees into the system. "The current economic environment is one that is beneficial to ITEX’s business model. I refer to a 1992 NY Times article that profiled ITEX and the barter industry during another significant recessionary period in the U.S. The ITEX broker in the story, who is still a franchisee today, stated that when times were good he had difficulties signing up new members, but as the economy declined, he had to turn some businesses away. Like some of ITEX’s competitors, we should be seeing a measurable increase in the overall number of members and transactions taking place within ITEX’s marketplace, but based on publicly available financial information, this is not taking place. We believe that this is in part due to decisions made by the company over the past few years that have resulted in the ITEX Corporation not being able to capitalize on all of its potential opportunities. "The second priority is to improve ITEX Corporation’s corporate governance. As we detailed in our letter sent to ITEX’s Board, there presently exists outside business relationships between the three directors and their various companies. "We also feel it is necessary for ITEX to hire a separate CFO in either a full-time or part-time capacity to allow the CEO to focus on his responsibilities while ensuring that the proper internal checks and balances exist. Are you personally interested in being on the Board of ITEX? "It is our belief that independent board members who do not have outside business relationships with one another will help to ensure good governance practices are in place while also introducing ideas and initiatives to improve the company." What do you see as some possible reasons (both negative and positive) that might make you sell your shares? "I cannot comment on reasons we might buy or sell the stock." In addition to granting the interview, Mr. Polonitza also kindly agreed to answer follow-up questions from readers on the topic of ITEX. If you have any questions you would like to see answered by Mr. Polonitza, please post them in the comments section, and a follow-up interview will be posted on this site in the near future. Imagine a company that doesn't hand out stock options, but where management owns a significant but non-controlling stake in the company. Now imagine that its CEO has been at the helm for almost 25 years, slowly building up his personal wealth by growing the company's stock by double-digits annually, employing little to no leverage in the process. Such situations are rare, but they do exist. Now imagine that you can buy a stake in such a company at an attractive price, due to the fact that its industry is going through a cyclical downturn. Consider Jewett Cameron (JCTCF), a company that sells wood, metal, seeds and industrial products to retailers, manufacturers, and builders. Revenues for this company have plunged, as it was exposed to two groups that have been particularly hard-hit by this recession: boat manufacturers and home builders. But Jewett has shown an uncanny ability to weather the storm, as it remains profitable despite a 30+% drop in revenue. The company was able to reduce its headcount by over 20%, and fold in some of its operations into its owned facilities, thereby reducing leasing costs. While the company both trades for and has shareholder equity of $18 million, its book value is likely understated due to the value of its land holdings. Most of its land holdings were acquired and built in 1995, and have been carried at cost since then. But the company owns over 18 acres of land, including over 140,000 square feet of office, manufacturing and warehouse space just a 25 minute drive from downtown Portland, Oregon. The fact that the company has been able to derive average returns on equity of 15% over the last five years suggests that either the company is getting more use out of its land than the land carrying value would suggest its worth, or that it has some competitive advantage. After subtracting the company's cash balance, the stock trades with a P/E under 10. When the incentive structure for an able management is properly set up, the potential for success increases significantly. In the case of Jewett Cameron, management shares with other shareholders both the downside risk that comes with failure, and the upside potential that comes with success. Furthermore, with a strong record of success over the long-term, management has proven its ability. With the current economic situation keeping revenues low, shareholders may currently be offered an opportunity to buy into this company at an attractive price. We have discussed a couple of companies on this site that don't trade on the major exchanges (e.g. the NYSE, the Nasdaq etc). Though it has been mentioned that over-the-counter stocks do not offer investors the same protections as do stocks trading on the exchanges, the details were not explored. However, there are some "smell tests" investors may wish to apply to such apparent opportunities. Consider NewMarket Technology (NWMT), a company that provides a range of technology-based services. The company has total assets of $53 million, and has net current assets of $12 million. However, the company trades for just a couple of hundred thousand dollars! 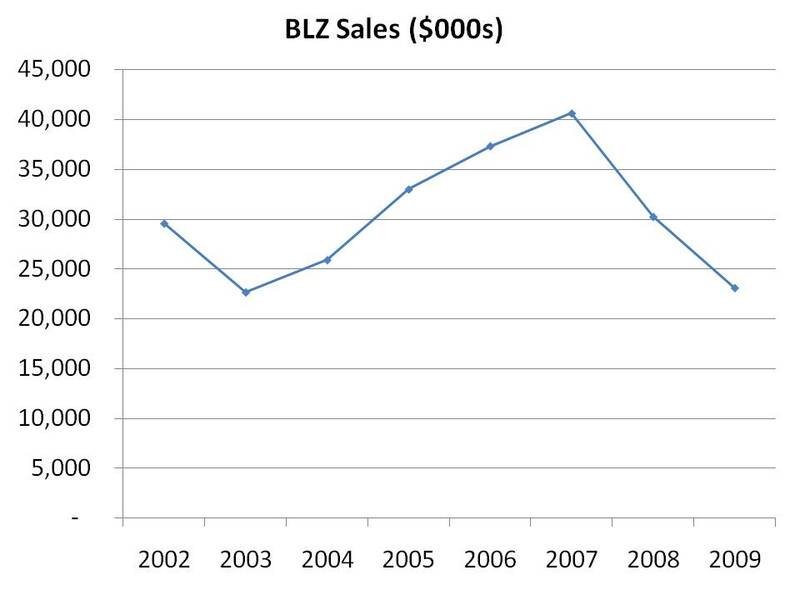 For a company with $100 million in sales, how can this be? It is possible that the company is not a scam at all, but just a victim of poor management. The company has issued several rounds of preferred shares, which are convertible to common stock. The conversion rates are extremely dilutive, resulting in the issuance of millions of shares that flood the market with this company's stock. Investors who believe this company to be legit should beware of further stock issuances, as convertible preferred stock remains outstanding. But upon further investigation, there may be more to this story than the idea that this is simply an undervalued stock undergoing a flurry of dilution. While the company claims to have "over 600 employees" and its "target markets are located domestically in all 50 states", it is very difficult to pinpoint from where the company runs its operations. It's impossible to reach anyone by phone at the company's headquarters, as calls to the company's two provided numbers repeatedly went unanswered! E-mail and phone requests to the company's investor relation's department were also ignored. Public companies are required to have independent auditors, which provide some form of comfort to investors. But this company has gone through several auditors in the past few years, each of which appears to have little in the way of name recognition but much in the way of legal issues. The auditor of the company's 2008 financial statements is now barred from practice, as per these findings of the SEC. The newest auditor is a two-person, husband and wife tandem who appear to operate out of their own home, for this a $100 million, international company! It's important that it be re-iterated that it's not clear that NewMarket is a scam. But it's never clear whether a company is acting fraudulently. Investors in companies that trade over-the-counter must take special steps to ensure the investment is legitimate, since the added layer of protection added by the major exchanges is absent. Since the #1 principle of value investing is "Never Lose Money", companies that don't pass these basic tests should be discarded. Mirant (MIR) produces and sells electricity in specific markets within the US. It trades at its lowest price in several years, and currently has a P/E of just 3 and a P/B of just .35! It has almost as much cash as it does debt, despite operating in an industry where higher debt loads are considered safe. As demand for power has dropped as a result of the recession and environmental conservation efforts, prices in the future are expected to be lower than they have been in the recent past, leading to profit projections considerably lower than current profits. Electricity prices are volatile, however, which can allow investors to take advantage of short-term pessimism. Furthermore, Mirant operates in an industry with high barriers to entry, as high regulations and high upfront capital requirements discourage potential new entrants. But while Mirant is superficially appealing based on traditional value metrics, it is substantially more complex than most of the companies discussed on this site. Not only is it several times larger than most of the companies we look at, but it also operates in several business lines, requiring the investor to understand a myriad of issues. The company uses over-the-counter and commodities market derivatives to manage its production capacity and its supply requirements, both to hedge its revenues and costs, as well as for proprietary trading. Furthermore, as a producer of dirty energy (fuel and coal based) the company is subject to numerous regulations from all branches of government, from the federal to the state to the local level. Some of these regulations require plant shutdowns (for plants that are not up-to-date technologically), while others can, and have, required billions of dollars in capital expenditures. The market cap of this company is only $1.5 billion, so the nature and timing of any future regulations can have a significant effect on the stock's valuation. While Mirant may very well generate excellent returns for stockholders at its current price, it's important that the value investor recognize the importance of investing within his circle of competence with an investment like this. An investor that doesn't fully understand the risks to a company such as Mirant (and there are several including environmental, regulatory and financial) can receive unwelcome surprises that destroy his principal, thus violating the first rule of value investing. Indeed, the company went bankrupt just 7 years ago, catching a different group of shareholders off guard (albeit with a much higher debt burden than it currently carries). *Note: A few hours ago, the company announced that it would merge with RRI Energy in an all-stock deal, making this stock's value somewhat more difficult to estimate, since an understanding of both companies is now required. John Kenneth Galbraith coined the term "conventional wisdom", calling it a convenient and comfortable point of view that is often false. Indeed, Levitt argues, much of what we accept to be true really isn't, and only by asking the right questions can we know this. Levitt believes sloppy or self-interested thinking leads to common beliefs that are actually untrue. Individuals with vested interests will often permeate untruths in the hope of effecting change. Levitt cites examples where advocates for the homeless and women's rights have been known to inflate their numbers to make their causes more significant. Ideally, we would count on the media to scrutinize the info before it is brought to air, but Levitt argues that the media is a willing participant. They too rely on the self-interested to fill papers with jarring pieces of wisdom that few are going to question. A little creative lying can draw attention and money, for both the expert supplying the data and the media enterprise that helps spread the message. Working together, journalists and experts create much of what comes to be known as conventional wisdom, argues Levitt. Every day, experts and journalists fill the business news with an explanation for what happened in the market, but are their explanations true, or just taken as such? Even if incentives exist for a particular action, information assymmetries can cause destructive outcomes. Levitt discusses various corporate scandals, and how they were caused by certain groups possessing information that other groups did not have: research analysts Henry Blodget and Jack Grubman wrote positive research reports about stocks they knew to be junk; Frank Quattrone covered up investigations into his company, Credit Suisse; Sam Waksal and Martha Stewart dumped shares of ImClone on inside information; managements have fabricated billions of dollars in revenues. All of these situations exist because one group has information that other groups don't have. They seek to profit not by normal means, but by exploiting this information differential. They do this by either promoting false information, or hiding true information. Most types of crimes leave visible victims, such that even if the perpetrators aren't caught, it is known that a crime has been committed. Such is not the case with respect to crimes of information, which can go completely undetected. You are more likely to listen to the advice of an expert. But because of information assymmetries, the expert may be acting in his own interest. The weapon of choice for such experts is often fear. "If you don't agree to this surgery", or "without this safer car", or "by not accepting this offer for your house", "the consequences may be dire". The internet is a useful tool in reducing information assymmetries, but they will always exist to some extent. Readers may wish to follow the advice of Charlie Munger: "Fear advice that, if implemented, is good for the advisor. Learn the basic elements of your advisor's trade, and double-check/disbelieve much of what you're told." This report will read eerily similar to that of the last quarter, since many of last quarter's trends continued into the first quarter of 2010. 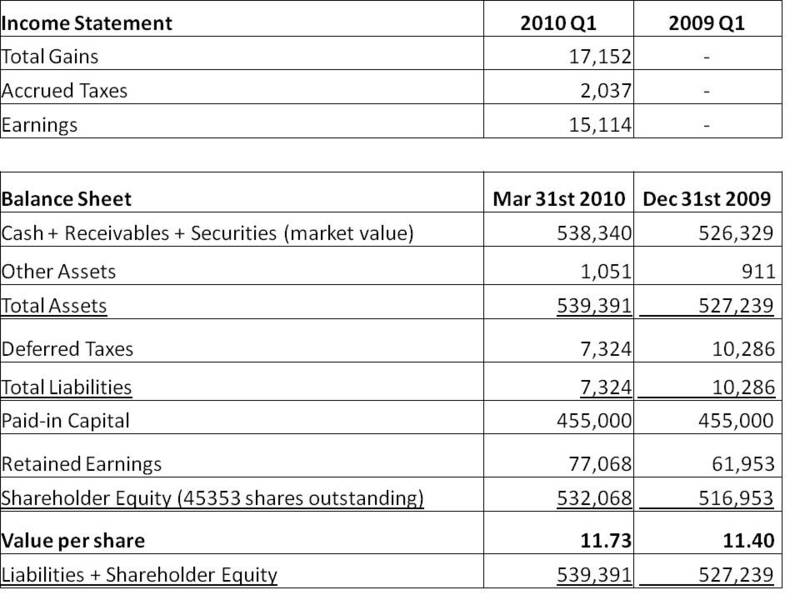 For the first quarter ended March 31st, 2010, KVF earned 33 cents per share, bringing the value of each share to $11.73. The markets had another strong quarter, with most indexes up in the low to mid single digits. As such, most funds will have made money in this period. However, the true test of whether this (or any other) fund is adding value will take place over a period of several years and through both bull and bear markets. Once again, weakness in the US dollar (relative to the Canadian dollar, the fund's reporting currency) hurt results. Had the exchange rate ended the quarter at the same position at which it started the quarter, earnings this quarter would have been almost 20 cents per share higher. Currency volatility is likely to continue to have a significant bearing on quarterly results, but over the long-term it is not expected to be a material factor. With the currency rates where they are presently, however, owners of Canadian dollars who have a long-term perspective are offered opportunities to buy securities around the world at what appears to be a favourable rate. As the market rose over the quarter, some stocks were divested following their exceptional price run-ups. These stocks include Key Tronic, Chromcraft Revington, Hardinge, and LCA Vision (further details are available where linked). Despite these divestments, KVF continues to own a great many stocks that are deemed to be undervalued. At the same time, as downside risks in the market have risen (thanks to the market's continued rise), KVF is also capitalized to seize any opportunities the market may offer through both temporary or prolonged pullbacks. In previous posts, we've discussed how forecasts are rarely accurate, and are better at telling us what has happened rather than what is going to happen. So why then do we continue to "consume" forecasts, growing a market for those who continually churn out mountains of useless forecasts? A question he asks professional fund managers is to write down the last four digits of their phone numbers, and then estimate how many doctors live in their capital city. Those with the last four digits above 7000 report on average 6762 doctors, while those whose last four digits are under 2000 arrive at an average estimate of 2270 doctors. Incredibly, the phone numbers of fund managers play a role in helping them answer a completely unrelated question! This study is by no means unique. In this paper, Tversky and Kahneman asked subjects what percentage of African nations are part of the United Nations. Before they could answer, however, the authors had the subjects spin a rigged wheel of numbers that would land on either 10 or 65. As readers may by now predict, the answers of subjects were strongly influenced by the random number that came up on the wheel. Montier strongly believes that we should ignore forecasts, and instead use value-based strategies based on trailing earnings or PE's. Furthermore, he argues that analysts should stick to analyzing, not forecasting. However, since this would require a radical re-think of the investment process, he doesn't see this as likely. Vicon Industries (VII) sells video surveillance equipment. The company trades for just $23 million, but has cash of $15 million, current assets of $36 million, no debt, and total liabilities of just $9 million. In addition, the company owns a couple of buildings (one in NY State, and one in England), which are carried on the books for over $6 million. As such, from an asset point of view, the stock looks compelling. But the earnings picture is not so clear. 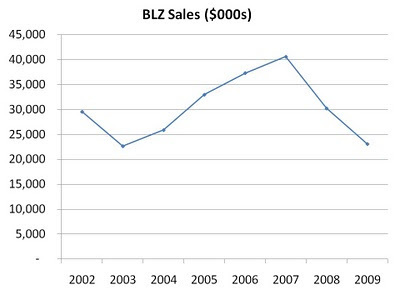 The last business cycle was not kind to this company. Vicon appears to operate in an extremely competitive industry, as there are constant downward pricing pressures that result in tiny or negative margins. A large chunk of revenues must be spent on R&D just to keep up with the competition, some of which are several times larger than Vicon. As such, the company hit a wall in the last calendar quarter of 2009, as the lack of newly completed buildings/renovations finally caught up to the company: sales (year-over-year) were down almost 30% to $11 million. However, the company's situation is not as poor as the sales record would indicate. While the company's sales were just $11 million, it recorded orders (i.e. future revenue, likely) of over $13 million for the 2nd straight quarter. The company appears willing to use its cash reserves to prop up its share price, as the company has been buying back shares at a decent rate, with plans to continue to do so. An important caveat, however, is a pending lawsuit on the company for patent infringement; to its credit, the company has been successfully defending itself, but the plaintiff continues to escalate its appeals. The stock does have a margin of safety from an asset point of view. But both the long-term and short-term earnings situations are murky (thanks to the competition and the cyclical situation, respectively), making this a tough decision for value investors! One of the most important determinants of whether a company makes for a good long-term investment is the industry within which it operates. We've discussed the boom and bust nature of the housing industry, the generous margins garnered by the soft-drink industry giants, and reasons why airlines make for poor long-term investments. But on the average, what do industry returns look like? Clearly, there is high variability in returns on capital by industry. 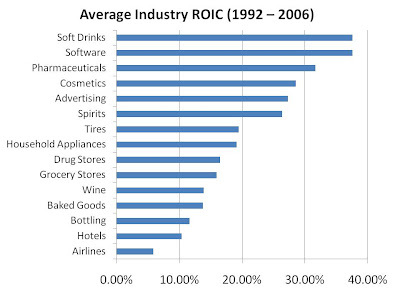 Average industry ROIC in the US was calculated at 14.9% by Porter, demonstrating that some industries are clearly extremely profitable, while others destroy capital. Does this mean you shouldn't own a company whose industry returns fall below the average ROIC? Absolutely not! Within industries, returns may also be highly variable, in the case where one or two companies have differentiated themselves or are low-cost producers that generate consistent industry-beating returns. Furthermore, even companies with meager returns can trade at such large discounts to book that returns on the market price of equity are quite high. But you may still want to stay away from the airline industry! Consider the magnitude of the year-to-year revenue increases/decreases! As such, when revenues decline, the company will most certainly lose money until it can lower its costs accordingly. Operating profits for Belzberg continue to be negative, as the company is still scrambling to cut its costs in line with this new revenue environment. But due to the nosedive in the company's revenue and operating margin, the company's stock price may have overreacted. While Belzberg trades for just $8 million, it has $20 million of cash against just $8 million of total liabilities. In addition, the company has a few million dollars of current receivables, sweetening up the offer for potential shareholders. With such a large margin of safety and no debt against it, the company can continue to lose money for a few quarters before shareholders risk losing capital. However, to see large stock price gains, extraordinary sales or profit growth isn't necessary. If management can cut expenses to the point where the company is at a break even level, shareholders at this price are likely to be rewarded. To that end, the company has announced layoffs and freezes that should help in this regard. However, the company does have some fixed costs which are likely to be difficult to cut. If these poor revenue conditions continue for several quarters, a merger with a company with similar costs may be the only way to profitability. The current margin of safety on the company's stock may allow shareholders to benefit from either of these options. It is not easy to design incentive schemes, because the underlying behaviour such schemes encourage are more complex than they originally appear. Levitt argues that there are three types of incentives: economic, social, and moral. A scheme designed to provide an economic incentive can often cause havoc with the social and moral incentives, resulting in a surprising outcome. Consider an experiment done at a daycare where parents would often pick up their children late. A small fine was instituted in order to discourage late pick-ups. The daycare expected on-time pickups to rise, but instead, the opposite happened, and late pick-ups soared! Levitt argues that this is because the economic incentive did not compare to the counteracting moral incentive that was now removed: with the fine, parents were implicitly told that it was okay to pick up their children late, as long as they paid the fine. When the fine was removed, late pick-ups did not drop back to their original levels. Now, parents no longer felt guilty about late pick-ups, as the moral incentive had been removed. Would a larger fine have caused the economic incentive to be larger than the moral one it failed to substitute? Perhaps, but economic incentives that are too strong often have other unintended effects. Cheating is an economic act: getting more for less. Levitt discusses a few examples where cheating has occurred because the economic incentives were so strong. He discusses data grabbed from school boards that appears to show teachers were actually changing student responses on standardized tests, as teachers whose students performed well were often awarded large bonuses. Would massive option and bonus payments cause Wall Street executives to cheat? Obviously, we all respond to incentives, both negative and positive. If you touch a hot stove, you get burned. If you speed, you receive a fine. These are just two examples of every day occurrences that shape our behaviour as a result of the pain or rewards we receive in response to an act we commit. But sometimes incentives are so complex that they can result in unintended behaviour (including cheating, and a removal of other incentives) that can offset the intended benefits! To demonstrate these ideas in action, Levitt takes the reader through a few quick examples in the introduction. First, he discusses the crime wave in the United States of the early 1990s. Crime was on the rise, and all the experts were saying that it would continue to do so, for various reasons. Instead, crime - of all types - started to drop in dramatic fashion, and once again the "experts" had their explanatory, after-the-fact opinions (perhaps much like the media attempts to explain daily stock price movements). But Levitt argues that they all missed the boat. Instead, he argues that the legalization of abortion in 1973 (which occurred during Roe vs Wade) is the biggest reason that crime started to drop in the mid-1990s and continued to do so. Many of the people who were most likely to commit crimes (those born of poor, unmarried, teenage mothers) were not born! Secondly, those who believe a real estate agent is on their side are sorely mistaken. On the surface, it seems as though an agent's incentives are aligned with those of a prospective seller. After all, the realtor's final commission is tied to selling price. Levitt demonstrates, however, that after expenses and sharing commissions and kicking up fees to the company, a real-estate agent doesn't make a whole lot for incremental increases in price. For example, on a $300K house, the seller would get $9400 for a 3% increase in price, but the agent's additional share is just $150. As a result, an agent just wants to get a deal done as quickly and effortlessly as possible, rather than put in a whole bunch of extra time and work to get the seller the best possible price. Are real-estate agents simply a special breed of sleazy slime balls? Not really, as Levitt argues this type of thing is common to all professionals, including doctors, lawyers, auto mechanics, plumbers etc. The difference, though, is that real-estate data is abundantly available, and so it is easy to demonstrate this phenomenon with this particular group. Levitt separated real-estate data into two groups: in the first, the agents were selling their own homes, while in the second, they were selling other people's homes. Levitt found that agents left their own homes on the market for 10 days longer, and sold them for an extra 3% (all other factors equal). Finally, Levitt tackles the issue of money and politics. While most people believe elections can be bought, Levitt argues that the data just doesn't support this. The winning party does spend more money than the losing party, but many confuse the cause-and-effect of this relationship (like the czar who heard that the most diseased region of his country had the most doctors...and subsequently ordered all doctors killed). Most campaign donors want to support a winner, which is why the winner spends the most money. To show this, Levitt looked at campaigns where the same two candidates went head to head and different amounts of money were spent. Levitt found that halving ones campaign spend resulted in only a 1 point drop in final performance. Value investors believe that Mr. Market's mood swings offer them excellent opportunities to buy low and sell high. But how does an investor avoid becoming Mr. Market rather than taking advantage of him? Influence, by Robert Cialdini, helps us understand the factors that influence us, which are exploited by, among others, the news media, our brokers, and research analysts, and thereby puts us in a position to protect ourselves from our own, hard-coded biases that we wouldn't otherwise know have been triggered. In this the final chapter, Cialdini reminds us of how important it is to recognize the shortcuts we employ in the making of decisions, as described in the previous seven chapters. He argues that as the amount of information which is at our fingertips continues to grow (thanks in large part to the internet), humans will increasingly need to use the cognitive tools we have developed to make decisions. These shortcuts are useful. Without them, we would need to analyze every detail of every situation, often duplicating the work of others or even ourselves. But their use also makes us vulnerable to error. Compliance practitioners who understand these shortcuts can use them against us. Cialdini urges readers to be aggressive against such practitioners. We should shun products that use such tactics in their advertisements, and send letters to the ad agencies demanding honesty in their marketing. He also advises that we refuse to watch tv programs that use canned laughter, refuse to tip bartenders that we see filling up their own tip jar, and shun night clubs with line ups that offer false evidence of the club's popularity. Boycott, threaten, confront, and censure, in order to retaliate. It's the only way to ensure that these shortcuts remain useful.